“Organizations Doing More Together” Southern Baptist Disaster Relief (SBDR) teams respond to fires, ice storms, tornadoes, damaging winds, hurricanes, and flooding across the United States. SBDR is one of the three largest relief organizations in America and includes flood cleanup efforts and long-term rebuilding in the wake of flooding. Southern Baptist volunteers prepare most of the meals distributed by the American Red Cross, as well as provide additional vital disaster services. Southern Baptists have more than 1,550 mobile disaster response units on call for local, state, and national emergencies, with more than one hundred thousand trained volunteers scattered across the nation. Our own D.R. Crew is one of many SBDR ‘Recovery Units’. Also known as ‘chainsaw units’, these groups of volunteers are some of the first to render aid after natural disasters. Removing downed trees, clearing pathways into damaged properties, and helping property owners move and recover personal items are just some of the ways they demonstrate Christ’s love in the midst of catastrophe. 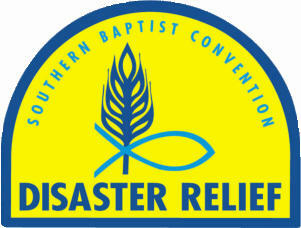 The first Sunday in November each year is Southern Baptist Disaster Relief appreciation Sunday. Click the arrow to see the many ways that SBDR volunteers bring help, healing and hope to those affected by disaster. I n addition to our Recovery Unit Crew, the ARVBA Disaster Relief Team includes members who have been trained to work with SBDR Feeding Units, ‘Mud Out’ crews, and in other areas of disaster relief. The ARVBA Disaster Relief Team is ready to minister in Jesus’ name wherever and whenever the call goes out!